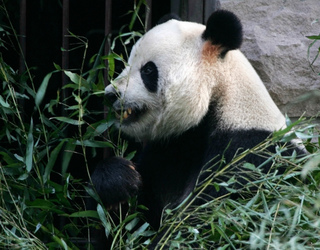 Just because they are cute and cuddly does not mean pandas can't be violent when provoked or startled. A teenage at the Beijing Zoo learned this the hard way when he jumped over a barrier surrounding an outdoor exercise area for pandas while 8-year-old Gu Gu and another bear were being fed. The teen startled 240-pound Gu Gu, who bit the unwanted visitor on both legs. The 15-year-old boy was so viciously attacked that his bones were showing. Chunks of flesh were left behind in the ambulance, according to medical officials. Gu Gu had reason to be startled. It was once bitten by a drunk tourist. 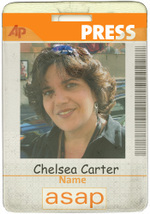 For more, check out this AP story by Anita Chang. William Russell Redfern, an armless artist known for drawings he does with his feet, has turned himself in to face a misdemeanor charge in a fight with a man who later died. Police say Redfern head-butted and kicked Charles Keith Teer during a Sept. 17 fight over a woman. Teer complained of dizziness and collapsed. 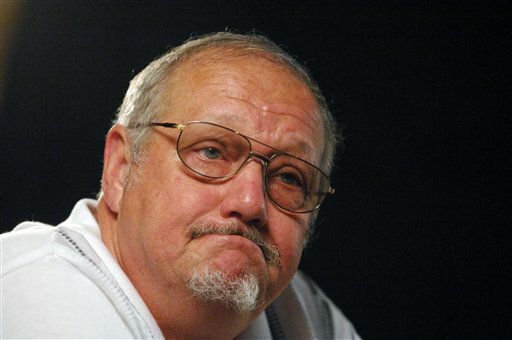 The AP reports a medical examiner determined last week that Teer likely died of a heart attack. Police Chief Roy Whitehead said investigators decided against felony charges but felt Redfern should be punished for the fight. Redfern was born with no right arm and a stump below his left shoulder. He was released Wednesday on $1,213 bond, a jail official said. 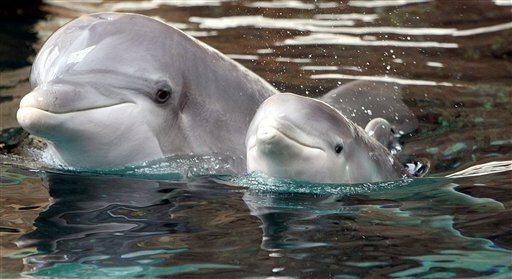 DOLPHINS: Baby Dolly swims with her mother at the zoo in Duisburg, Germany. The babe was shown for the first time today. DINOSAURS: Turns out the velociraptor (made famous by "Jurassic Park") might have had feathers. They'll have to make another sequel to the movie to update the dino features. COWS: Gear up for the big cattle-selling months ahead. ALLIGATORS: Remember the man who's arm was bitten off by a gator? Well, now he might be getting his just reward. "I don't have any friends," said _______. "Every friend that I've had, practically, has wanted to borrow money or something and of course, once they borrow money from you, you can't be friends anymore." Answer: Jack Whittaker, who won a record $315 million Powerball game. Read what Whittaker told AP's Shaya Mohajer about what dark turns his life has taken in the nearly five years since he won. ANIMAL RIGHTS: Red, orange, yellow, green, blue, protest. 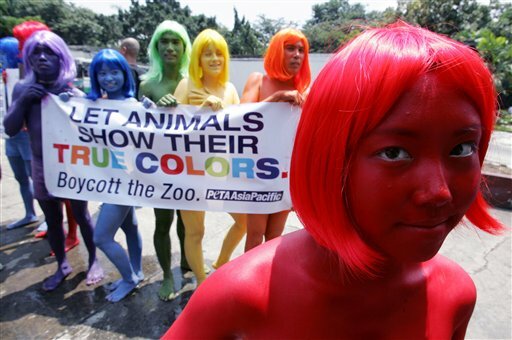 PETA demonstrators in Manila, Philippines, rallied against the zoo, saying the animals suffer while in captivity. BIRDS: Are the birds eating your bullets? MANATEES: The cows of the sea have some more time before they're brought one notch down from "endangered" status. -- Hillary Rhodes in Lake Michigan. This is how the story might sound if told by a surfer: So this dog was like totally drowning in the chop, and this dude got his stick and saved him. Translation: A surfer rode a wave on his stomach to rescue a struggling dog Tuesday that had been swept off a pier and into Lake Michigan by a wave. "He put the dog up on his surfboard, and the dog rode the surfboard in to shore," said Royce Rodgers, an off-duty Muskegon Heights police officer who witnessed the rescue. 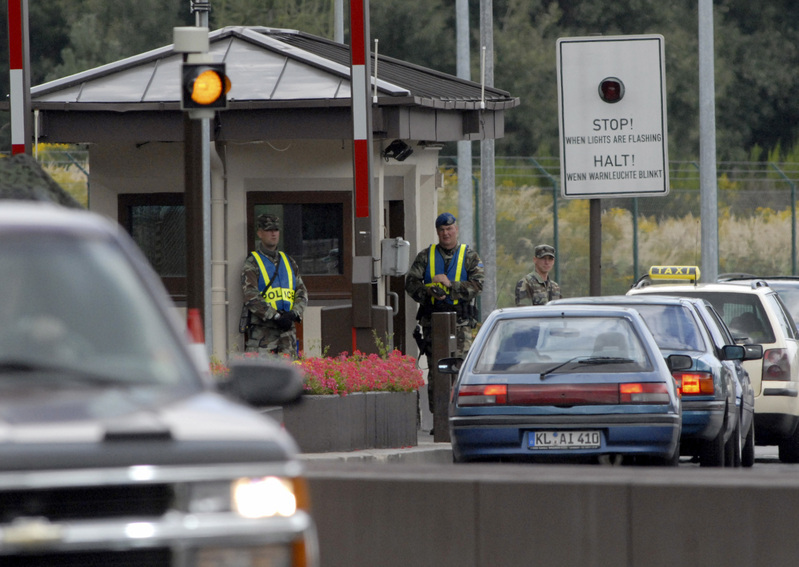 The images rushed back today -- as they often do for asap reporter Chelsea J. Carter with such news: Three suspected Islamic terrorists from an al-Qaida-influenced group were arrested on suspicion of plotting imminent, massive bomb attacks on U.S. facilities in Germany. Today's AP story by David McHugh reported: A senior State Department official said German investigators had determined the Frankfurt International Airport and the nearby U.S. Ramstein Air Base were the primary targets of the plot but that those arrested may have also been considering strikes on other sites, particularly facilities associated with the United States. For many this will be a new chapter, a new incident in the post-Sept. 11 world we now know. For Carter, though, this isn't something new. It's a reminder of events more than 20 years ago where Americans in Germany were targeted by terrorists with deadly consequences. Follow the jump to read what Carter went through in Germany on Nov. 24, 1985. 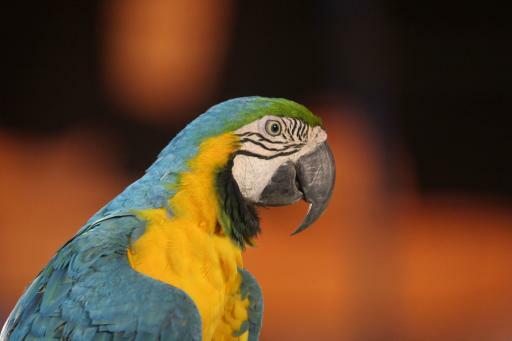 MACAWS: This beautiful bird is part of a circus in Allahabad, India. Circuses there ain't what they used to be. In the first half of the 20th century, there were as many as 50 touring the country. Now, there are only ten active groups. DOGS: Guess what our football players and Ireland's footballers (well, at least one of each) have in common? EAGLES: Karl Rove's car is covered in eagles. Very funny, Mr. Colbert. DOLPHINS: It's either a really rare dolphin, thought to be extinct, or ... the Loch Ness monster looking for some Lo Mein. A fire in Boston, protests in Chile and a hip-hop video made at the A&P. Those are just some of the stories getting attention from contributors to NowPublic, the "crowd-powered media" site The Associated Press recently started working with to selectively incorporate citizen journalism -– especially photos and video -– into its news report. Listen to this audio clip to get details from NowPublic's Brian Kennedy. 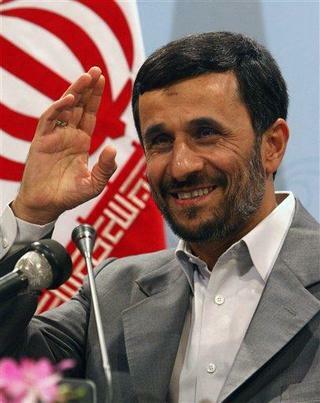 Iranian President Mahmoud Ahmadinejad speaks with media during a press conference in Tehran, Iran, on Tuesday.